Philadelphia 76ers head coach Brett Brown. There are organizations who are living embodiments of the phrase, "Never a dull moment!" and there are organizations who make even the dullest moments of the calendar feel like Evil Knievel riding a motorcycle through a flaming hoop over a pool of sharks. The Philadelphia 76ers lean closer to the latter, and the Bryan Colangelo burner saga is just one more brick in the foundation of their haunted house. After over a week of investigating and deliberating, the Sixers decided it was time for an exorcism. 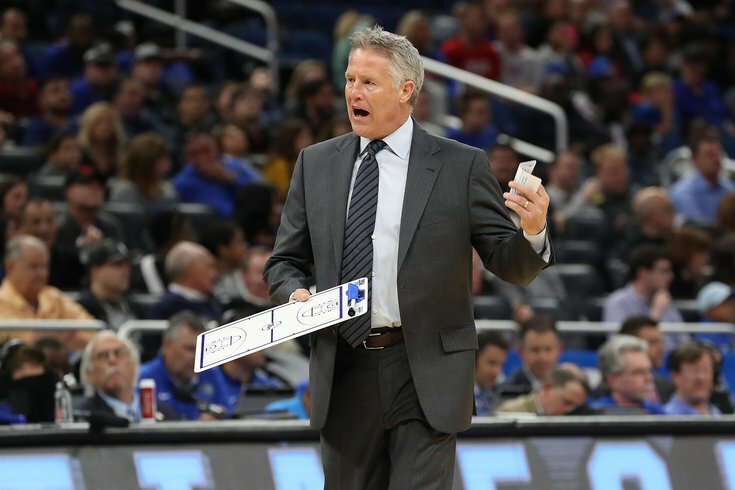 Colangelo has parted ways with the team, and Brett Brown will be taking over basketball operations on an interim basis while the Sixers figure out a more permanent solution. The head coach (and now GM!) openly admitted it's not an arrangement he believes is sustainable over the long-term. "I have no desire to get involved with the day-to-day stuff that a normal general manager needs to go through to build this, that's not my desire at all, nor is it my belief that that's an effective way to move an NBA program forward," said Brown. "My role is one of trying to provide the best leadership that I can, and show faith and support and have fun with this." But during a 25-plus minute sitdown with the media on Thursday afternoon, Brown and Sixers owner Joshua Harris laid out what exactly the operating procedure is moving forward, and how the team will navigate the most important summer for the franchise in decades. Uncertainty will hang over the franchise, and the pair of men did their best to try to clear the smoke away on Thursday afternoon. Journey with me, if you will, into Philadelphia's vision of what's left to come. Leave it to a franchise that is infamous for shapeshifting timelines to leave the most important once in recent memory up for debate. But this time it at least makes sense — Harris says the team is not primarily focused on getting a person in place as they are making sure they identify the best possible person for the job. "We will begin the search for a new general manager immediately, interviewing both internal and external candidates. As always, we will take our time and try to make the choice that best positions this franchise for long-term success. It's not about making the choice quickly, it's about making the right choice," said Harris. This is, undoubtedly, the approach the Sixers should be taking. It's not a stretch to say this is the best GM opening that has come along in the NBA in recent memory. Most organizations with players/prospects of this caliber, cap space, and room for lots more internal growth do not have jobs become available at the top of the program. That's because those sort of teams are most often built by long, storied careers by executives at their respective stops. We will go into ... free agency with a proven style of play, a proven way where we try to grow people and a culture. We will walk into that room with our head high and our shoulders back. The uniqueness of the situation has afforded the Sixers one luxury: they can pitch just about anyone on this job and draw their interest. Who that eventual winner will be is up for debate at the moment, but the allure is quite obvious. "We will go into a place where you're talking about free agency with a proven style of play, a proven way where we try to grow people and a culture. We will walk into that room with our head high and our shoulders back," said Brown. Coming off a 52-win season certainly helps, too. All of the talk about the importance of good management and facilities and everything else is all well and good, but the Sixers finally have players other guys around the league should and will want to play with. Those players, by the way, were at the heart of this burner account scandal. Joel Embiid specifically was the target of a lot of scorn from the tweeter(s) in question, which would have made for quite the awkward situation if Colangelo stuck around. But the head coach insisted it had been addressed with the team, and he feels confident in their ability to move forward. "I have spoken to all our players. There was a level of uncertainty when it was first declared. When it first became public, there was certainly confusion," said Brown. "I have had the chance since then to speak to most of our players, and it certainly was an incredibly unfortunate situation that confused people, it confused our players. We feel strong communication with our players has been achieved." So then, on to the stuff that actually matters. The NBA Draft is on June 21, and the Sixers don't have a clue who their lead decision-maker is going to be moving forward. That's a major issue, particularly when you put a head coach forward as the face of your organization. That's no disrespect to Brown's aptitude, it's just an entirely different job than the one he's used to. That made Harris' answer to a question about organizational structure that much more interesting. I gave both men an opportunity to declare whether someone would have final say come draft time specifically, and Harris ultimately didn't offer a single name on that front. The way we've run the draft process and free agency process pretty much forever since we've owned the team is that we hire really good people and we allow them to voice their opinions. We almost have what would in my day job be an investment committee, there's a lot of dialogue and debate around the table and there's a consensus we try to develop. Ultimately the GM is given a large vote, but if we're not on board for it it doesn't happen. Truthfully when Brett was the coach and there was a separate GM, we would spend a lot of time forming consensus...we think we get better results and better thinking and better decisions when we do that. That's how David and I run our businesses in our day job, and that's how the Sixers operate. It's very rare you can't ultimately arbitrate a decision, and I think if it ultimately came down to that, Brett, David, and I would have to go in a room and figure it out. But it's very unusual where we would have a decision like that. I don't think Harris needed to divulge the fact that the Sixers try to build consensus through various staffers in order for us all to know that. If you only needed one person to come to draft and free agency decisions, NBA staffs would be a hell of a lot smaller and more cost-efficient. Input is not just expected but required from all levels of the organization. We needed to have someone who ultimately spoke for the basketball organization, and we felt like Brett was the right candidate for that. Brown further highlighted this by complimenting Colangelo for the staff he left behind, highlighting the structure that remains in place now that Colangelo has moved on. He name-checked Alex Rucker (VP of Analytics & Strategy), Ned Cohen (VP Basketball Operations & Chief of Staff), and Daniel Medina (VP Athlete Care), and then with some assistance from Harris included Marc Eversley (VP Player Personnel) and Elton Brand (GM of the Delaware Blue Coats). That doesn't really determine, however, how we reach the point where we know who is locking in on a draft prospect. And that sort of uncertainty is a little off-putting, especially when you have someone like Brown leading the show. The coach is wired (as all coaches are!) to make decisions in order to best win games in the immediate term, and now has to help shepherd a process in which the long-term has to be a huge part of the equation. He's in a totally different part of the decisionmaking chain now. Panic isn't warranted here yet, but some investigation on this front is in order, because a power vaccuum can create all sorts of possibilities. "We needed to have someone who ultimately spoke for the basketball organization, and we felt like Brett was the right candidate for that," Harris said of selecting Brown to be their temporary head honcho. No disagreements here — there's not a better representative for what Philadelphia has to offer in Brown. His story is one that should resonate with players and front office candidates alike. Maligned as a joke with many of his players during the lean years, Brown was given enough rope to see this project through to the other side. For people within the cutthroat world of professional sports, that's about as close to an inspiring story you're ever going to see. That Brown has taken the opportunity and run with it, earning the trust of his players and a 52-win season, is what's really important here. Brown has cache among players in his locker room, and now that it includes legitimate stars and veterans around the league, people are going to take notice. Though he noted having a GM in place offers a certain level of stability — no duh, obviously — Brown agreed with the sentiment of everything else carrying weight, too, especially in the form of players on the roster. "When you say, 'Why did somebody go play someplace?' You would think it's because I'm playing next to Ben Simmons, Joel Embiid and Markelle Fultz, and I hope they respect the style of play we play. I hope they research me and my coaching staff. And I think those things are the things that ultimately tip somebody into making a decision," said Brown. "I think we're going to be just fine...we're going to go into the marketplace with a real story to tell." That Fultz was included in this group seems pretty significant. He could have easily deferred to another talented young player in Dario Saric, or used the All-Defense abilities of Robert Covington to make his case. But he settled on the No. 1 overall pick who barely played last season, which is a great vote of confidence for the player who many around the city have written off already. Put it like this — there is still plenty to be excited about in Philadelphia. A number of candidates, who we will discuss in the coming days, will have their names floated into the conversation for the top spot. For now, it should be enough to have the head coach and the young talent they have in place. Those are the guys who will work alongside another star every day, and freed from this Twitter scandal, they can now make their best pitch to the game's greats.